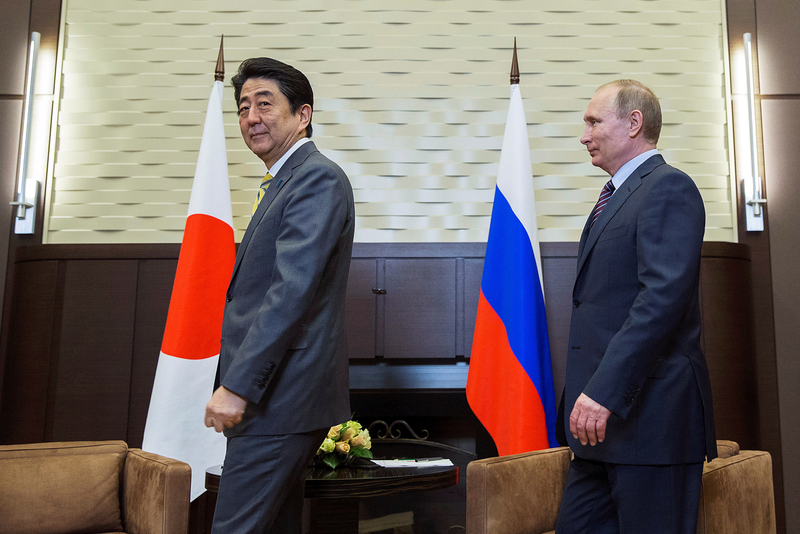 Russian President Vladimir Putin (R) and Japanese Prime Minister Shinzo Abe (L). The upcoming Russia-Japan summit might mark the beginning of an actual compromise on the Southern Kuril Island territorial dispute, but this can only be the first of many steps, writes a Russian Japan expert. In mid-December, the leaders of Russia and Japan will hold a summit that is bound to discuss the 70-year old Southern Kuril Island territorial dispute and a related package of economic cooperation. While the meeting has been hailed by the Russian and Japanese media as historical chance and, indeed, a lot is at stake for both sides in this “tug-of-peace,” the key challenge will be to maintain a long-term commitment and motivation after the summit, should the actual territorial negotiations gain traction. A new visit by President Putin has been on the cards since 2013 but was impeded by the G7’s response to the Ukrainian crisis. Nonetheless, Russia’s tensions with the West did not prevent the Japanese leader from meeting Putin more frequently than U.S. President Barack Obama. Abe’s proactivity (or even hyper-proactivity) and pragmatic cooperative approach towards Russia, unprecedented in scale and ambition, marked a strong contrast not only between him and other Western leaders but also between him and many of his predecessors. The prime minister consistently filled the deal pipeline of bilateral cooperation with concrete projects of mutual interest – with relevant publicity in the Japanese media, which was unimaginable a decade or two ago. He further raised the profile of his economic charm offensive by appointing Hiroshige Seko, head of the key Japanese Ministry of Economy, Trade and Industry, as the first ever minister in charge of economic cooperation with Russia. On the Russian side, in contrast to past attempts at reconciliation, several top government officials assigned a high priority to the development of a detailed economic cooperation package. Among them are Deputy Prime Minister Igor Shuvalov, Industry and Trade Minister Denis Manturov and, until recently, Minister of Economic Development Alexey Ulyukayev, whose arrest was likely met with concern on the Japanese side but so far appears to have had little effect on bilateral relations. The continuity of Abe’s conciliatory stance on Russia will limit any criticism from the prime minister’s predecessors who now sit in the opposition. At the same time, Abe and his foreign policy adviser Shotaro Yachi kept alive other channels of strategic communication with Russian establishment figures such as Secretary of the Security Council Nicholay Patrushev, then-speaker of the lower house of parliament Sergey Naryshkin and the upper chamber speaker Valentina Matviyenko. A two-day series of talks in, firstly, Nagato, Yamaguchi Prefecture and, secondly, Tokyo will (intentionally or unintentionally) mark 60 years since the 1956 Soviet-Japanese declaration was ratified by the parliaments of both countries. President Putin and Foreign Minister Sergey Lavrov have reiterated that the document remains the basis of Russia’s approach towards the resolution of the Southern Kuril Island problem. While Abe proposed a new approach, he also recognized the importance of the 1956 declaration for Russia’s approach, thus hinting at a drift from the 1993 Tokyo declaration and therefore from the intransigence of numerous previous leaders to the possibility of a compromise. By doing so, the Japanese leader demonstrated not only initiative and reliance on strong personal ties with foreign leaders but also something that has long been missing from bilateral dialogue – a robust political will. The modern-day Russian public views even the handover of smaller two islands rather negatively, which narrows the range of bargaining options – or, at least, their public discussion. According to some Russian experts, such as Tokyo-based historian Vassily Molodiakov, the sensitivity of the Kuril Island debate in Japan was somewhat heightened by the nation’s post-war politicians. Namely, the general public was led to believe that all four islands are bound to become Japanese, even though such a promise was unrealistic and borderline populist, since the politicians in question did not have the physical ability to actually deliver on it. The USSR until Mikhail Gorbachev opted not to recognize the fact that the dispute even exists – somewhat in the way the Japanese leadership treats the Senkaku dispute. Still, to date the Russian leader has been demonstrating willingness to seek the resolution of the territorial dispute with Japan and to build trust with the Japanese leader. At the same time, in the long term the clock plays against Japan given that the islands have been long administered and controlled by Russia. In terms of international security, it is North Korea and China not Russia that cause the most concerns for Japan. One may argue that it is Abe who has the best shot (and some time, given the likely continuation of his leadership until 2021) at achieving any kind of breakthrough on the matter, as his successors and their audience may instead prioritize pressing domestic economic issues, rendering the Kuril dispute more marginalized. Will it be difficult for Abe to sell the deal to the public? Most projects envisaged to be funded or supported by Japanese entities in the Russian Far East are bound to benefit Japanese investors and trading houses whose overseas operations the Abe cabinet has been consistently promoting. Furthermore, the strengthening of energy ties via enhanced supply of coal, liquefied natural gas (LNG) or even electricity from Russia would be welcome, given the Japanese public’s staunch opposition to Abe’s plan to revive nuclear power generation. In terms of international security, it is North Korea and China not Russia that cause the most concerns for Japan. Now to the “elephant in the room.” What implications does Donald Trump’s electoral victory have for the prospects of a Russo-Japanese peace deal? Prima facie, Trump’s campaign rhetoric suggested less interventionism, so he and designate National Security Adviser Mike Flynn seem likely to drop any prospects of hindering Russo-Japanese rapprochement, especially if it comes to the subject of balancing China. Some might argue that Abe’s vigorous engagement of Russia was partially predicated on the expectation of Hillary Clinton’s win, which would keep Russia’s bargaining power rather low due to sanctions and further attempts at isolation. At the same time, campaign rhetoric may change after the inauguration and much will depend on the actual personality of not only the new Secretary of State but also the new American handlers of the U.S.-Japan alliance. Indeed, with Trump in the White House, that opportunistic motivation may be weakened. Nevertheless, Abe’s quest to improve ties with Moscow actually started as early as 2013 and therefore pre-dated post-Crimean sanctions. Furthermore, he has already displayed his determination to rely on personal ties by becoming the first foreign leader the U.S. President-elect met in person. In parallel, the Japanese leader demonstrated consistency in defiance of changing circumstances by pushing the Trans-Pacific Partnership ratification through the Diet (Japan’s bicameral legislature) even though Trump’s victory has all but buried the agreement’s prospects. Bearing in mind the above-described uncertainty and Abe’s inclination to hold sensitive negotiations behind closed doors, little tangible detail is likely to emerge prior to the actual summit. And it is in the interest of both parties to keep it real and manage expectations. The December summit might mark the beginning of an actual compromise between Russia and Japan, but this can only be the first of many steps. However, the two countries have never been as close to a breakthrough as they are now. The writer is a doctoral candidate, at the faculty of Asian and Middle Eastern Studies, St. Catharine's College, University of Cambridge. He has been active in projects involving academics in Japan, Kazakhstan, Uzbekistan and Azerbaijan.